Think!, the government's road safety campaign, has launched a new ad to drive home the amount of information that is missed by people when they're looking at their phones. The ad is the last effort by Abbott Mead Vickers BBDO before it hands the account over to Y&R London, which won the business in June. The 90-second film starts with a fast-moving shot of a lively roadside as it would be seen from a car, lasting 2.3 seconds. The viewer is then asked via on-screen text, "Did you see the pink kitten?" 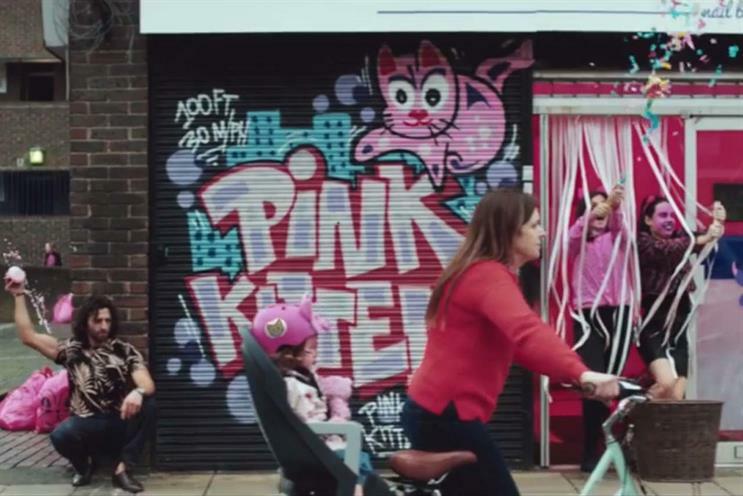 The rest of the running time is a slowed down version of the first two seconds, in which it is revealed that the scene is dotted with images of pink kittens – 100 in total. But the one that really matters is being held by a young girl in the arms of her mother, who is about to be hit by a driver looking at his phone. It was created by copywriter Neil Clarke and art director Jay Phillips, and directed by We Are From LA through Iconoclast London. The media-buying agency is Carat. The spot is soundtracked by a slowed version of Aphex Twin’s 1999 track Windowlicker, marking the first time the electronic musician has agreed for his music to be used in an ad. The campaign follows more severe penalties for using a phone while driving, introduced in March this year. According to RAC research last year, more than a third of young drivers aged 17 to 24 admitted to using their phone while behind the wheel. The stretch of road shown in the film is 100 feet (30m) long – a distance travelled in 2.3 seconds by a car at 30mph. This statistic will also be brought to life in an activation today at Stratford International station in east London. A 100-foot pink banner will be unravelled to generate a sense of scale communicated by the campaign. Think! ambassadors will be present to talk and interact with commuters.